Greece (Hellenic Republic) is a country in southern Europe. It shares borders with Bulgaria, Macedonia, Albania and Turkey. The capital city is Athens. Other big cities in Greece are Thessaloniki, Patras and Piraeus. Greece is well known for its history and its islands. The country is also a member of the European Union and uses the Euro as its currency along with 16 other countries in Europe. Greece is heir to the heritages of ancient Greece, the Roman and the Byzantine Empire, and nearly four hundred years of Ottoman rule. Greece is the birthplace of democracy, the Olympic Games, western books, and western drama including both tragedy and comedy. The Iliad, an epic poem written by Homer in the 8th Century BC, is the oldest work of western writing. Ancient Greece was not a single country; Ancient Greece was divided into lots of small city-states in the south and two kingdoms in the north. Generally the south was much more advanced; Athens and Sparta, the most powerful Greek cities, were in the south. There were many wars between the cities, and it was not until 338 BC (338 'before Christ') when they were all united to fight against the Persians under King Philip II of Macedon, one of the two kingdoms of the north. When Philip died his son, Alexander The Great, took his place and campaigned against Persia, establishing a new era, the Hellenistic era. After the Hellenistic era, in 146 BC, the Roman period began when the Romans ruled over Greek lands. After a century the whole Greek-speaking world became part of the Roman Empire. Greek was the language used by most of the people in the eastern parts of the Empire, while Latin was spoken more in the west. In 330 AD the capital of the Roman Empire changed; Byzantium, an ancient Greek city, became the new capital, which was then renamed to Constantinople (in Greek: 'The city of Constantine' meaning the emperor who chose Byzantium as the new capital). In the following years the Roman Empire was divided into two parts; the east part became the Byzantine Empire. In 1453 the siege of Constantinople by the Turks took place, the Ottoman Empire was then established. The Ancient Theatre of Epidauros. For almost four centuries, Greece was part of the Ottoman Empire. In 5 March 1821 Greeks started a revolution so they could be independent. 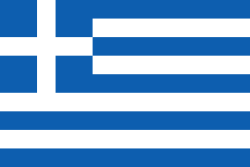 Greece became an independent country on 3 February 1830. Many wars occurred before Greece gained the lands it has today. Greece also took part in the two World Wars. Greece fought alongside the Allies in World War II and the Entente in World War I. A civil war took place after the World Wars, too. After a military junta of 1967–1974 a vote was held for Greeks to decide whether they wanted Greece to become a Republic or to remain a Kingdom. The Greek vote of December 8, 1974, resulted in the end of the monarchy in Greece and the establishment of the current Third Hellenic Republic. revolution — when the people try to change the government by force. Greece became the tenth member of the European Union on January 1, 1981. The country adopted the Euro in 2001 and successfully organized the 2004 Olympic Games in Athens. At the moment Greece is facing big economic and social problems. An ancient theatre and the Parthenon, ancient Greek temple, a major site in Athens, the Greek capital. Santorini, an island formed by a volcano, 3,000 years ago. Four fifths of Greece consist of mountains or hills, making the country one of the most mountainous in Europe. The highest mountain in Greece is Olympus, the mythical house of the ancient Gods. Western Greece contains a number of lakes and wetlands. Greece has also many islands, over 6,000, the largest being Crete. Other well-known large islands are Rhodes, Santorini and Corfu. Greece is an active earthquake zone, small earthquakes occur every year in Greece, especially in Western and Southern Greece. Greece has a coastline of over 13,600 kilometres. Mount Olympus, at 2,917 metres, is the highest mountain in the country and is believed to be the home of the Greeks Gods in Greek Mythology. The climate of Greece can be categorized into three types: the Mediterranean, the Alpine and the Temperate. The Mediterranean type of climate features mild, wet winters and hot, dry summers. The Alpine type of climate features harsh winters with large snowfalls, while the summers are cool with many thunderstorms. This climate is to be found on high mountains. The Temperate type of climate features cold, damp winters and hot, dry summers. A church in the old town of Rhodes. Greece's population is around 11 million. The majority of people living in the country are ethnic Greeks with some people from foreign countries like Albania and Bulgaria staying in the country at the moment. The most spoken language in Greece is Greek, as well as the official language of the state. But there are also people who speak Bulgarian and Turkish close to the borders with Bulgaria and Turkey. Greek language has a history of almost 4,000 years. English is widely spoken as a foreign language, along with other languages such as French, German, Italian and Spanish among others. These five languages are also provided around the country's schools. Education in Greece is required from the ages of 5 to 15. The majority of Greek people are Greek (Eastern) Orthodox (95%) and it is also the state religion. There are other Christian groups in Greece, too, the largest being Catholic Christians; the majority lives in the Cyclades and the Ionian Islands. The country's oldest religious minority is the Jewish community, however, it is no longer the largest non-Christian group. There are also some Muslims residing in the Northern Greek region of Thrace, close to the Turkish borders. Greek cuisine is a typical Mediterranean cuisine, similar to those of Italy, the Balkans, Turkey, and the Middle East. The majority of national foods are based around olive oil, vegetables and herbs, grains and bread, wine, fish, and various meats. Also important are olives, cheese, aubergine, courgette, and yoghurt. Greek desserts are characterized by the dominant use of nuts and honey. Greek salad is widely known around the globe. The most famous sport among Greeks is probably football. Greeks also tend to listen to foreign music a lot, while Greek music is famous in countries in the Balkans and the Middle East. A beach in one of Greece's islands. The old city of Corfu. Greece attracts more than 16 million tourists each year. Greece has been an attraction for international visitors for a long time because of its rich and long history and more recently for its glorious Mediterranean coastline and beaches. The most popular destinations for tourists are the Cyclades, Athens, Crete, Rhodes, the Ionian Islands, where the island of Corfu is, and other coastal regions of the country as well as places of archaeological interest. There are 17 sites that are included in the list of UNESCO World Heritage Sites, Among them are the Acropolis of Athens, the ancient sites of Vergina and Olympia but also the old cities of Corfu and Rhodes.